I seem to have become an armchair modeler, doing nothing but reading magazines and blogs, and visiting on-line forums. But all of a sudden I got an urge to actually model something - a tree. 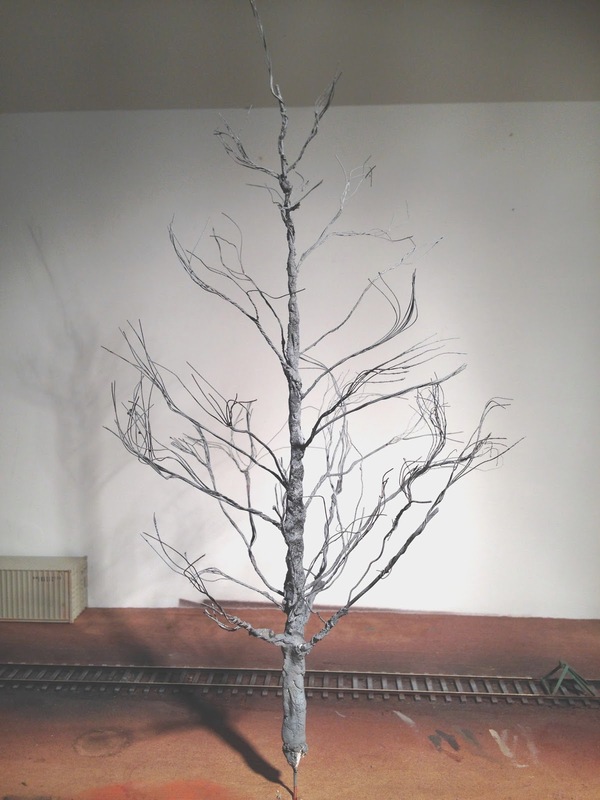 I have recently seen a number of examples on people doing trees using twisted metal wires to form the tree armature, and I wanted to give that a try. You probably know what I mean. Anyway, here is my attempt at a more or less bare tree, in late fall or early winter. What kind of tree? I don't know. A generic deciduous tree, I guess. This is the tree when all the wires have been twisted. Next step was to cover the stem and parts of some of the branches with spackel (lacking any other more suitable material such as modeling paste). It has also been painted with a gray primer out of a rattle-can. And it got a light dusting of black. Last i added some dry leaves by first spraying the branches with hair spray and then sprinkle on some crushed real oak leaves. I am happy with the result. Thank you for posting your model railroad blog. Your tracks and turnouts look great. Do you like the CVT turnouts? Yes thay are nice. How they work out in the long run I don't know. I haven't been doing much running lately.